The United Kingdom’s Church of Scientology in London, standing on Queen Victoria Street in the cultural epicenter of London, drew more than 3,000 Scientologists, citizens of London and dignitaries from every continent to its grand opening on October 22, 2006. 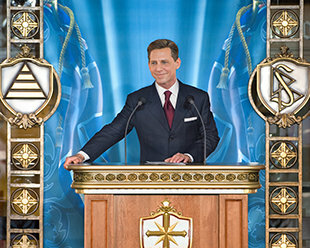 Mr. David Miscavige, Chairman of the Board Religious Technology Center and ecclesiastical leader of the Scientology religion, presided over the dedication of this new church. Among those joining Mr. Miscavige on the stage for the traditional ribbon-cutting were a London Police Chief Superintendent, the City of London Alderman and a United Nations Representative. Visitors and Scientologists are welcomed to the Church of Scientology London through its grand lobby, every day of the week. The Public Information Center displays provide a means for public to find answers to any questions they may have about Dianetics and Scientology. The Church of Scientology London bookstore makes the full body of basic Dianetics and Scientology scriptures available. One of the many distraction-free course rooms in the London Church where Scientology scriptures can be studied. The United Kingdom’s Church of Scientology, standing on Queen Victoria Street in the cultural epicenter of London, drew more than 3,000 Scientologists, London citizens and dignitaries from every continent to its October 2006 opening. The dedication of the new Church by Mr. David Miscavige, Chairman of the Board of Religious Technology Center and ecclesiastical leader of the Scientology religion, marked the significance of the occasion. Honored guests who participated in the dedication, each of whom had partnered with Scientologists in civic or humanitarian endeavors, included Commander Kevin Hurley, City of London Police; The Right Honorable Ian Lauder, City of London Alderman; and The Honorable Iftikhar Ayaz, United Nations permanent peace envoy and representative of the UN Human Rights Commission. “Which, as every Scientologist knows, is quoted in the famed L. Ron Hubbard chapter on responsibility in Advanced Procedure and Axioms. “All this organization represents as a force for preserving and bettering lives—our gift of literacy to disadvantaged children, restoring self-respect to those who have gone astray, easing suffering, eradicating racial prejudice and repairing the bonds that bind men together. “All that and more is about responsibility. It is about never sending to find for whom the bell tolls, because we know it tolls for us, and we know it because we are involved in Mankind.